A 39-year-old Oakland County man stabbed himself multiple times in the neck and chest when police attempted to arrest him Tuesday afternoon, June 6, in the parking lot of an indoor water park in Frankenmuth. The man was eventually taken into custody and hospitalized. Information on the extent of his injuries is not available at this time, said Frankenmuth Police Chief Don Mawer. 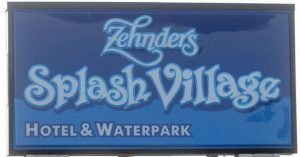 About 3 p.m. Tuesday, police came upon the man sleeping in his SUV which was parked in the lot of Zehnder’s Splash Village, located at 1365 S. Main St., nearby Bronner’s Christmas Wonderland, Mawer said. The man produced his license and when police ran a check on it they found he had a misdemeanor warrant for strangulation out of Oakland County, the chief said. When police returned to the man’s vehicle to arrest him, he took out a 6-inch blade and lunged it into his own neck, Mawer said. Officers backed off and a short chase around the parking lot ensued. At some point, all vehicles involved came to a stop and police began negotiating with the man, Mawer said. During this time, police barricaded the area and alerted the nearby water park/hotel along with Bronner’s. After 35 minutes of negotiations, the man began making “concerning” statements and wanted to speak with a family member when his brake lights came on and police feared he was about to drive off, Mawer said. Michigan State Police and Frankenmuth police vehicles rammed the man’s 2007 Dodge Caliber from both ends, disabling it, Mawer said. The man then took the blade and began stabbing himself in the chest until police blew out his windows with a bean bag gun and subdued the man with the non-lethal weapon and shock guns, the chief said. The man was taken to a Saginaw-area hospital for treatment of multiple self-inflicted stab wounds. It’s unclear whether any drugs were involved in the incident, Mawer said. Police believe the man had been living in his vehicle because it was full of personal items, the chief said. At the time of the incident, officers found the knife in the vehicle, but it’s too early to tell if there were any other weapons inside, the chief said. Because of the situation, police are checking on the man’s home in Oakland County to see if everyone there is OK, Mawer said. “There’s no reason he should’ve done this,” he said. The man could face charges of fleeing from police, the chief said, but any charges issued against the man are secondary to his health, he added.